This Edwardian 1910-ish Arts and Crafts era dress with hobble skirt is made of a yummy, plummy lightweight lavender silk jacquard with a pattern of interlocking circles that give it a floral effect. 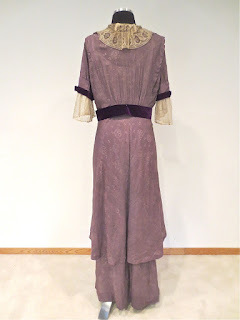 The bodice is trimmed at the side fronts, neckline and collar with a teneriffe type lace, while the 3/4 length sleeves are trimmed with a honeycomb mesh with decorative border. 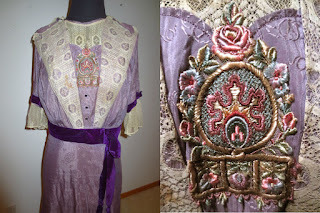 At center front is a fabulous silk trim of a medallion with a stylized crown or flame over an oval with three dots, all perched on a pedestal with three small flowers. The whole is surrounded by roses and other flowers in shades of rose, merlot, silver blue and green with vanilla ice. Under this are three small faceted black buttons which are merely decorative. Photo #6 shows it with a flash so the color is a bit skewed. 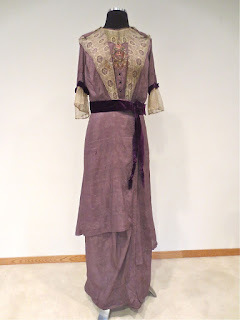 At the waist and sleeves is a thick velvet ribbon with bows, fastened at the waist with two hooks-and-eyes. 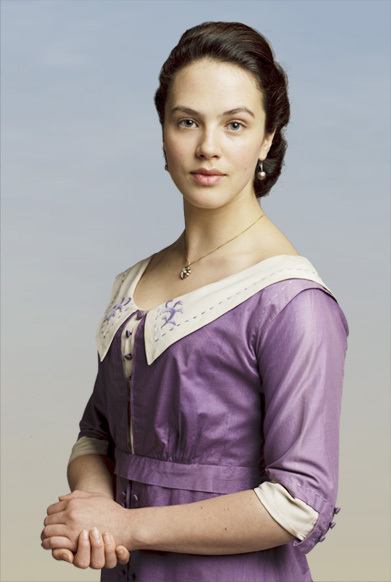 Over the silk collar with pointed ends is a rounded, pleated and stitched-down lace collar with stays [photo #8]. The hobble underskirt has graceful curved edges in front over a small insert at the lower edge giving the hem a straight look. Over this is an asymmetrical, bias-cut overskirt that would flutter beautifully when walking or moving. I would estimate this would fit a size small to a small medium, but please go by the measurements below. Condition is good vintage/antique. The following issues are noted. 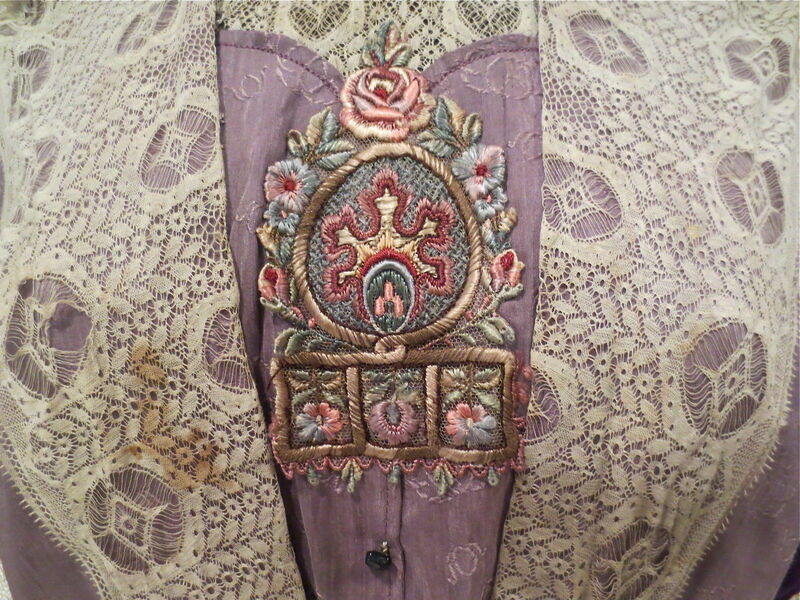 At the bodice, one of the lace medallions at the right front near the bust has broken threads. Just below this is a darker spot on the lace approximately 1-1/2” long. 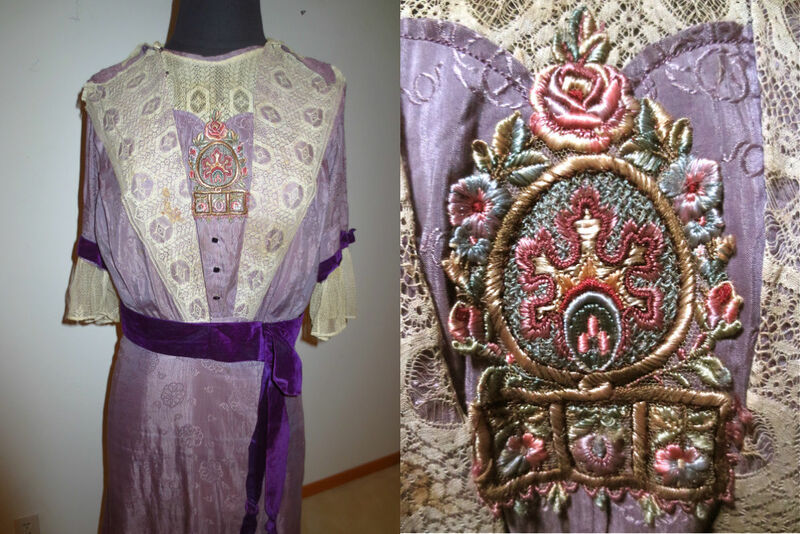 On the left side, just below that is a slightly grayed area on the lace [See photos #3, 4, 6 and 11 at lower right]. Photo #12 at upper left shows an L-shaped tear about 3/8” by 1/4” that is on the overskirt at thigh level in front. Just below that is a dark spot. There is another hole on the underskirt that is not seen. At upper right is a slight discoloration at the armholes. The most serious damage can be found on the right sleeve. The left sleeve is in near perfect condition, but the right sleeve shows wear and a whole area of holes where it looks like it may have been subjected to friction at the back. This area is 3” by 2-1/2”., and there are two more small holes just to the inside of the shoulder seam where there is a decorative fold. Photo #11, lower left shows details. 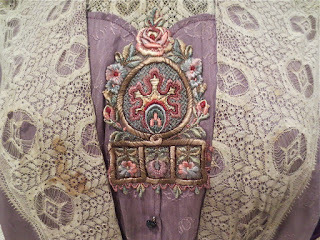 At the front of the sleeve is a hole near the lace [#12, lower left]. At the hem is a grouping of darker spots to the left of center which can be seen in #12, lower right. In addition, there is a small patch here. There is another patch on the skirt which is simply brilliant – one of the best ones I’ve seen and worth studying. In photo #11, the top two photos show it from the outside and the inside. It took me a long time to spot it! 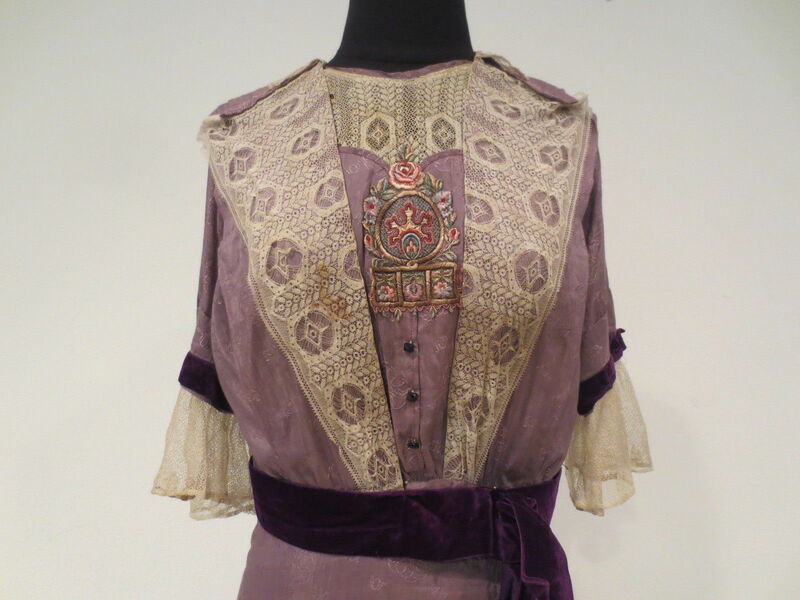 There are various other discolorations scattered on the lace. Nonetheless, it is a beautiful dress of this era, and with a little work to repair the sleeve and clean it, it could be worn. 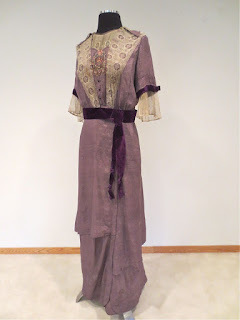 No, seller, you do not wear 100 year old dresses. Sorry. 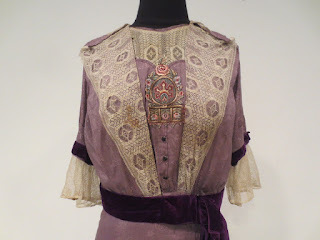 Not only would it fall completely apart, we wouldn't have anything for the next generation to look at in terms of antique clothing.